According to Fjällräven, the original Greenland jacket was introduced by Åke Nordin in 1968. Fjällräven (pronounced “fee-ahl-rah-ven”) has produced various versions of their “most classic” climbing jacket ever since, in a muted rainbow of Swedish-chic colors. Though the jacket has deep roots, Fjällräven presents it as a timeless, functional piece of outdoor hardware. Photos on Fjällräven’s website show boats sailing past massive ice sheets, hikers with misting breath, and campsites on crevasse-riddled glaciers. 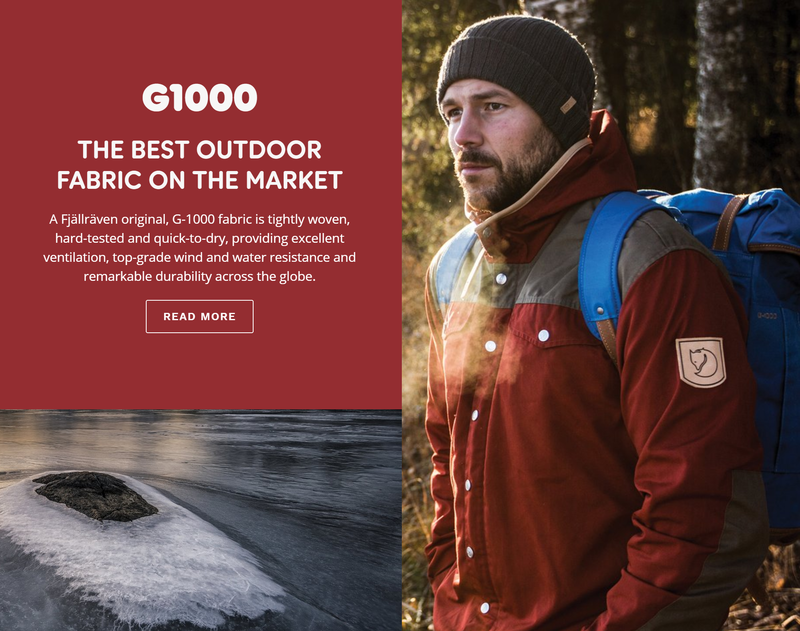 They call the jacket’s G-1000 material “the best outdoor fabric on the market,” and promotional videos and blurbs tout current product development and testing in Greenland. But a lot has happened in the outdoor world since 1968. How does Åke’s jacket stack up in 2018? The Greenland No. 1 Special Edition has a tall, slim, but generally true-to-size fit. The back of the jacket is long enough to cover my back completely while skiing or biking. The armholes are cut lower than those on most current technical jackets, and when you raise your arms above your head the body pulls up a bit with the sleeves. This is not a jacket for ice climbing or cross-country skiing, but there’s enough range of motion for general outdoor activities like hiking. The Greenland No. 1 is unlined and has a slightly rough, tailored look and feel on the inside. The stitching is solid and heavily reinforced in higher-stress areas. Seams are unsealed. The design is faithfully old-school. Instead of a water resistant zipper it has a color-matched YKK zipper under a full-length flap, secured with a row of shiny embossed snap fasteners. Instead of velcro or elastic cuffs, it has snap cuffs that remind me more of a dress shirt than a technical shell. Oh, and the Greenland No. 1 Special Edition sports leather trim around the cuffs and hood. Yep, definitely old-school. There are two side pockets and two chest pockets. The side pockets each have a single snap, but they’re relatively shallow and the snap has a tendency to un-snap during physical activity. The chest pockets are more secure, but are on the small side. The hood is relatively small and its simple cut doesn’t provide much range of motion. I would describe it as functional, but barely. Aside from its trim and tags the Greenland No. 1 Special Edition is made entirely of Fjällräven’s G-1000. G-1000 is a blend of roughly two-thirds polyester and one-third cotton. The fabric has a heavy, rugged and substantial feel–imagine a very fine, slightly waxy canvas. Instead of relying on DWR coating and a porous membrane (such as GoreTex) for water resistance, G-1000 is coated with Fjällräven’s “Greenland Wax,” a combination of beeswax and paraffin. The wax is rubbed on from a bar and then melted into the fabric with an iron, hair dryer, or camp stove (yikes!). Waxing instructions stitched to the inside of the Greenland No. 1 Special Edition. One of Fjällräven’s selling points for G-1000 fabric is that it can be customized to an individual’s preferences: more wax makes it more resistant to the elements, while less wax allows the fabric to breathe more easily. Paraffin wax treatments for organic outerwear were developed in the 1930s and quickly replaced older fabric treatments because paraffin was cheap, hard-wearing, and didn’t have the noxious smells of animal-derived oils. Waxed fabrics reigned as the material of choice for tents, rain jackets, pants, backpacks, and other outdoor gear into the 1970s. In 1969, the invention of Gore-Tex sparked a steady transition away from waxed fabrics and toward fully synthetic fabrics with “waterproof/breathable” membranes. From the 1970s onward, waterproof/breathable membranes have been nearly ubiquitous in the outdoor industry. 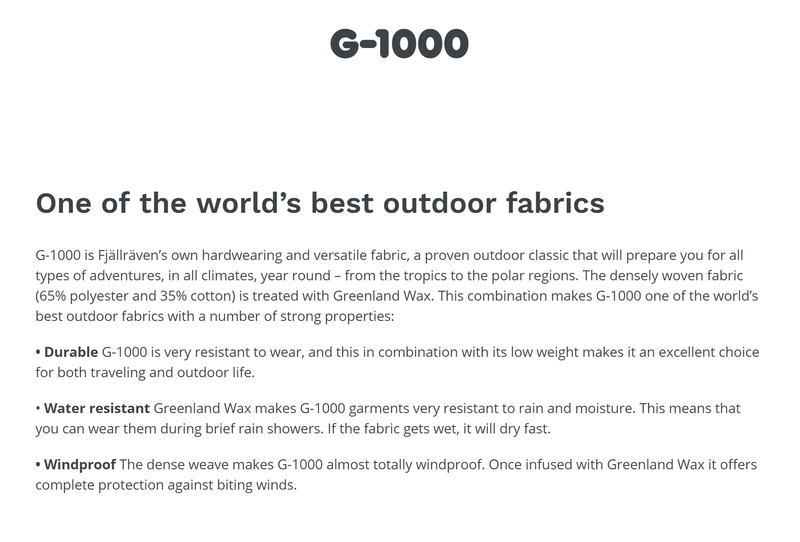 Fjällräven certainly isn’t shy about G-1000, and calls it “the best outdoor fabric on the market.” Fjällräven claims on its website that G-1000 is durable, low-weight, water resistant and fast-drying, windproof, and breathable. By calling their waxed poly/cotton blend the “best” outdoor material, Fjällräven is staking a bold claim: that for decades, by moving toward waterproof/breathable membranes the entire outdoor industry has moved in the wrong direction. I’ve used the Greenland No. 1 on hikes, bike rides, camping trips and as a downhill skiing jacket. There are many versions of Gore-Tex, but they all share somewhat similar properties and provide a useful reference point for a comparison with G-1000. Durability and Weight: Fjällräven is certainly correct that G-1000 is durable. It seems highly resistant to abrasion and punctures from trail use, and I’ve used it for yard work with no problems. On the flip side, the claim that G-1000 is “low-weight” is simply false. My Greenland No. 1 Special Edition, size large, weighs about 18 ounces. By contrast, my Arc’teryx Alpha FL mountaineering shell weighs about 11.2 oz and my fully-featured OR Foray rain jacket weighs under 16 ounces. 18 ounces is comparable in weight to the burliest unlined stormproof shells used by climbers on Denali or in the Himalayas. Water Resistance: To their credit, Fjällräven represents G-1000 as “water resistant” and not waterproof. Freshly-waxed G-1000 is moderately resistant to rain, which initially beads up and runs off of the jacket. After three or four downhill ski runs in a light drizzle, however, G-1000 soaks through. And once it’s wet the thick, 1/3 cotton G-1000 is slow to dry compared with fully synthetic shell material. Why does slow-drying cotton make up such a significant proportion of G-1000? The answer is probably simple: synthetic fibers don’t absorb wax. The cotton in G-1000 is needed to absorb and slowly release Greenland Wax, maintaining the jacket’s water resistance. But the cotton fibers that absorb wax also readily absorb water, especially when the wax has started to wear off. Gore-Tex has an overwhelming advantage here and it’s not even close: in my experience fully synthetic fabrics with a GoreTex membrane are far more resistant to wetting out, slower to transport moisture, and faster to dry than G-1000. Wind Resistance: Fjällräven says that wax treatment increases G-1000’s wind resistance, but in my experience the dense fabric is either fully wind-resistant even with minimal wax, or so close that it might as well be. Mosquito Resistance: As Fjällräven says, G-1000 is impervious to mosquitoes. But so is every other decent shell, down to Patagonia’s paper-thin 3.6-ounce Houdini. G1000 vs. Gore-Tex: final thoughts: Fjallraven promotes the ability of a user to “customize” the performance of G-1000 by applying more or less wax. In a video, a Fjällräven representative explains that “with more wax, you increase the water and wind repellence. With less wax, the garment is cooler and offers maximum breathability.” While this is true to a point, the “customization” could just as easily be put in terms of negatives instead: with more wax, the shell struggles to breathe, and with less wax the shell quickly surrenders to rain. Fjällräven’s claim that G-1000 is “the best outdoor fabric on the market” isn’t true in any meaningful way. G-1000 represents a solid execution of an old idea, but in terms of technical performance it is blown away by fully synthetic shells with waterproof/breathable membranes. At $300, the Greenland No. 1 Special Edition is on the pricey side for a shell. Fjällräven has a relatively small presence in the US, but it is easy to find online. I often see discounted Fjallraven jackets online at the end of each season, especially toward the end of winter. Fjällräven’s Greenland No. 1 Special Edition is a classic jacket with classic styling and classic performance. Though its roots may be in Greenland, it’s really at home in the frontcountry: walking to work in the summer, beach bonfires, photographing outdoor events, tromping in the woods with friends on a breezy afternoon. Today’s technical shells surpass the No. 1 Special Edition in terms of weight, breathability, weather resistance, range of motion, and other performance-related factors. But let’s be honest, most people don’t always want to feel like they just walked out of an REI catalog. This jacket is durable enough to wear bashing through the woods, and good-looking enough to wear downtown afterwards. The Greenland No. 1 has a nostalgic appeal similar to watching VHS tapes in a cozy ski cabin or taking a road trip in an classic truck. It’s not cutting-edge, but not everything always has to be. In a February 2018 Forbes article, Fjällräven’s North American President Nathan Dopp is quoted saying “we’re as much a premium style brand as we are an authentic trekking brand from Europe.” As they say: when someone tells you who they are, believe them. After nearly a year of use, Fjällräven’s No. 1 Special Edition still lives right by my front door and frequently leaves the house, but it almost never leaves town. Even packing it up for a short hike feels like a novelty. Overall, my opinion of Fjällräven is that–with a few qualified exceptions–they are an outdoor-themed fashion brand, not a fashionable outdoor brand. Nothing wrong with that, really. Just know what you’re getting, and pack accordingly.